What would I be capable of if I weren’t bound by the ethics of Christian charity? Let’s see. I might write something like this. 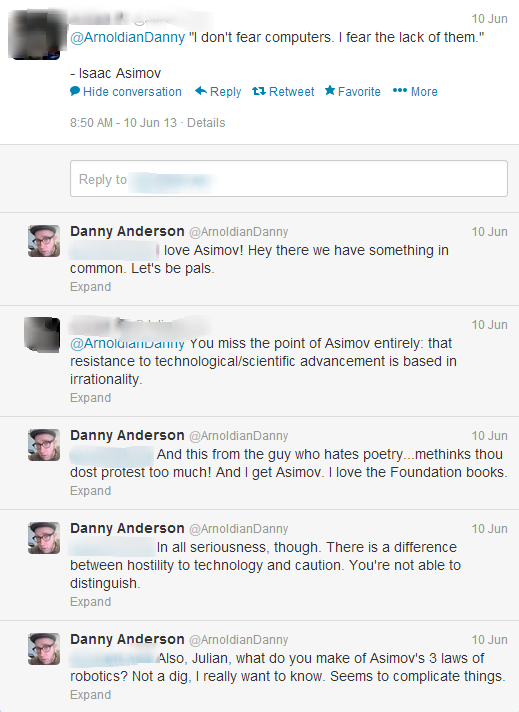 Earlier this week, from seemingly nowhere, I was attacked on Twitter by a complete stranger. I woke up, checked my email, and saw that some (I suppose we should call him a) person had responded to six or eight of my recent tweets in a most hostile manner. Nothing world-shattering here, merely me obviously ready for beddy-time. Nonetheless, our hero-from-the-Twittersphere apparently took great offense to this. First, while we’re on the topic of mirrors, let’s just say the blurring feature I’ve used here has done the world a great favor. But to my larger concern, what could provoke such disproportionate hostility? 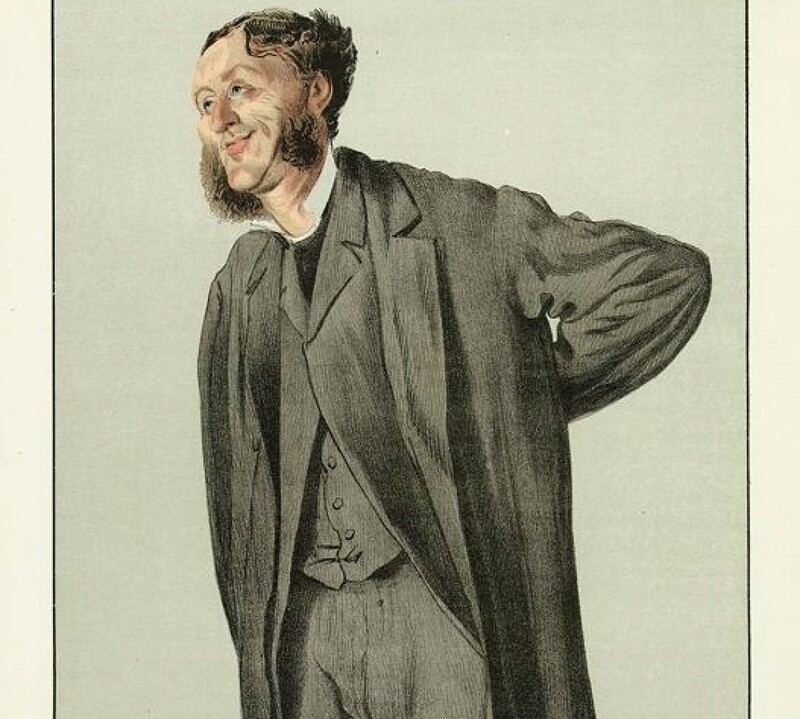 One might, if one were so inclined, assume that the lets-call-him-a-man who composed the response falls into the ever-useful category of “nerd.” The particular variety of geek I’m thinking of is that which so-wanted Second Life to make it big because their Actual Life was lonely and pathetic. Days spent lusting over this or that animated woman, nights occupied with online message-board arguments over authentic translations of Klingon. What have you. See now here is where I get confused. I can’t quite get myself to refer to the Tweet-consciousness as a person. This is why I reject the “nerd hypothesis” I just outlined. I kind of like nerds and find them to be extremely human. Instead, I honestly think that this… I guess for simplicity’s sake, we should call him a person… person conceives of himself as a “brand.” A product habitating a cyberspace where social awkwardness is rewarded with “followers” and body odor is irrelevant. The Onion recently captured the essence of such an individual. I’m quite convinced of this because of the full context of our exchanges. In addition to his defiant defense of the internet, I awoke to a barrage of insightful commentary about what he kept referring to as my “techno-phobia.” I assume from his use of this term that he thinks I’m against recognizing marriages between blenders and the iPhone 3. I’m not really sure what else it could mean. For some reason, I decided to jab back. Alright, I’m immature. I know this already. Move on. This wasn’t the end of his assault, either. I had also linked (at some point) to an article about attention spans and internet writing. I decided to fire a shot across the bows. Checkmate. A pathetic gesture that brings back memories of junior high, when the geek (usually me) guilted a moderately attractive girl to couple-skate down at the rink at 7:30 on a Friday night. And yes, I decided he would get nothing. And like it. 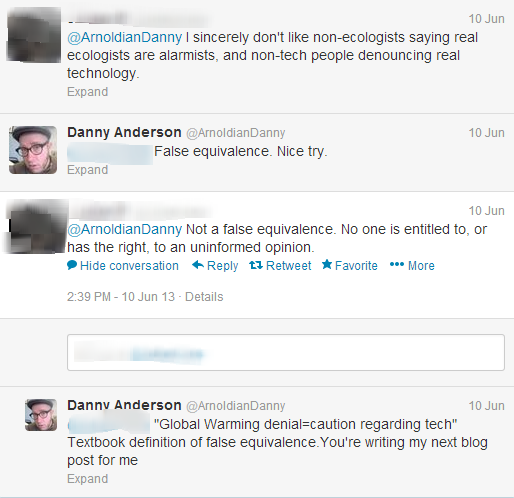 Only by nothing, I mean pushback against his egocentric techno-mania. Again, I know. Immature. Youbetcha. First of all, yes. His name is apparently Julian. Let it go. 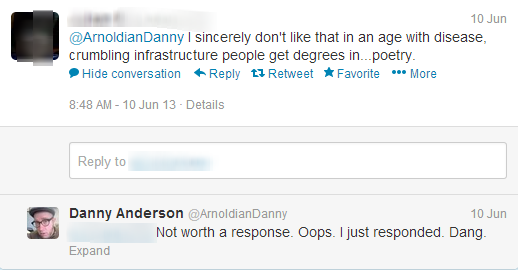 Focus instead on his lack of response when I brought up the specific implications of his quotation. This silence demonstrates to me that he basically found an isolated quote that, out of context, supports his narrow worldview. There is no attempt to struggle with the complications his “source” introduces in the conversation. In my freshman composition class, this merits a major point deduction. This is the root of my caution when it comes to messianic visions of technology. The world is not written in binary code. It is impressionistic at its most clear. …and so here we are. There was no immediate response, nor has there been a delayed one. The troll is never interested in depth, only the ignorant defense of ill-considered dogma — and the acquisition of “followers.” Well I will not follow a fool down a blind alley. 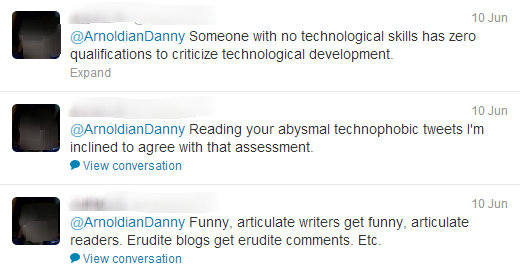 Despite this fellow’s assessment of me, I am not against technology. Case in point, I’ve employed it in the composition of this post and I use it in the classroom each day. I am, however, cautious about it. As a tool, it is wonderful. As a philosophy in and of itself? Not so fast. Just look what it has done to our poor troll’s ability to think. Fortunately, I am bound by notions of Christian charity, so I would never write such a mean-spirited, vengeful thing as this. As always, I’m ever-dependent upon Grace. I know very well the impulse to engage in a battle of wits with an internet troll and also how ultimately fruitless it is. There are some people for whom trolling is their one and only occupation. Thanks for sharing that, Erin. People do take things very personally don’t they? I totally agree with everything you say. Maybe the conflict you identify in the situation is the cause of my discomfort with this post. In a way, I loath myself for writing it. Thanks for reading and sharing your thoughts though! I sat, on a Saturday night, away from friends, away from civilization, alone and isolated, staring blankly into my computer screen, reading a post by a professor jabbing at a computer nerd in what can only be described as a “twitter battle.” Alone and in front of my computer, I felt I must be better than these two computer geeks!!! Adam, no doubt about that one! “No one is entitled to, or has the right, to an uninformed opinion.” Really? Freedom of speech — if this troll is from the USA — allows for all sorts of uninformed opinion-expressing. That statement makes no sense; and besides, either the second comma’s in the wrong place or the first ‘to’ should be deleted. (I admit to grammar geekdom). Your grammar-eye is strong, Ann. And you are correct. Even if I am uninformed, I’m covered by the US Constitution!